The medium Grab N Go rack storage box is a great versatile box that is perfect for organising your all you bits and bobs for your hobbies whatever they may be. 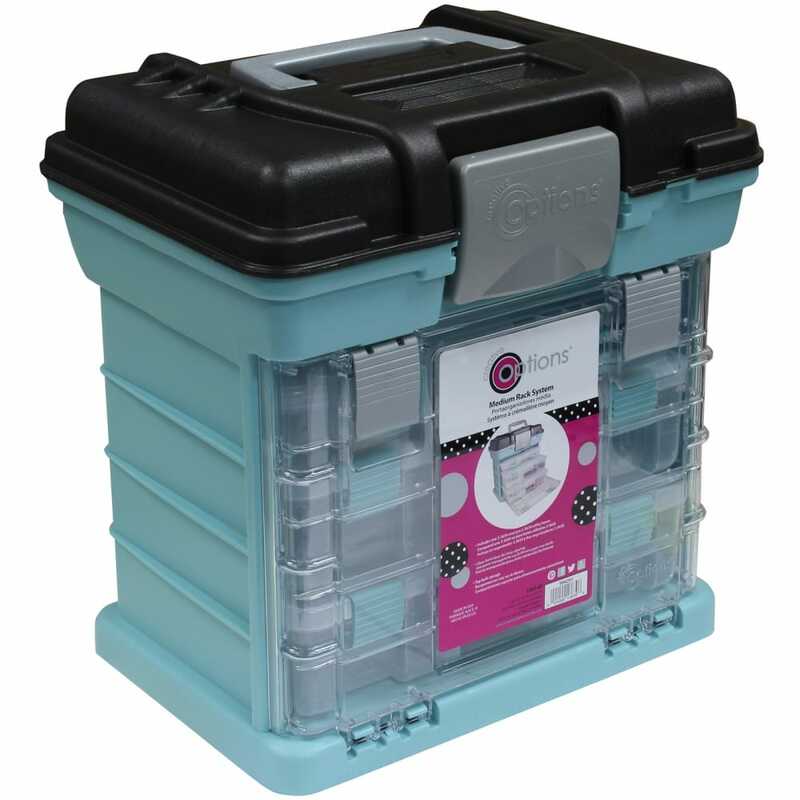 The rack system comes with bulk top storage access via a lift up lid with a deep storage area for larger tools also includes latched utility boxes these additional boxes are able to be customised with removable dividers so you can kit them out to suit your individual needs, the deep moulded handle gives stability and comfort while carrying. Ideal for beads, sequins, cake baking sprinkles, loom bands and more. A bit about the brand: Storage does not have to be boring these bright and colourful storage boxes will keep all your crafting bits n bobs all neat and tidy. Grab n Go storage systems are great when travelling to your crafting classes. Showing 2 Creative Options Medium Grab N Go Rack System Organiser - Soft Blue reviews. Average rating of Excellent. Would you like to write a review? The quality of this item is great, the design is fantastic and it looks fab. I store all my smaller baking items eg decorations and icing things and it's super organised now. I wanted something robust that I could take my textiles work on the go with. This box is excellent. A big box at the top for larger bits then three drawers of various depths that you can section off however suits you best. They all slide into the body of the box and are secured behind a Perspex door or as I like to do you can just take the box out you are using and not have the bulk. The product is well made, chunky plastic in great colours.